The major part of the North-West was originally administered from the Parish of Bingara, which began in 1882 with Fr Salvador as Parish Priest. Bingara covered Manilla, Barraba, Horton, Warialda, Gravesend, Yetman, Coolatai, Wallangra, Gramen, Boggabilla, Mungindi and Moree. Most, if not all, of the Priests were Italians and the then Bishop of Armidale, Bishop Torregiana, was also Italian. 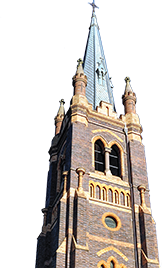 Moree became a Parish in 1889 and took with it Mungindi and Boggabilla. Father Lloyd, well noted for his boxing prowess, came to Mungindi once a month prior to its becoming a Parish in its own right. The official date given for the founding of Mungindi Catholic Parish was 1914. St Joseph’s Church, Mungindi was probably opened between 1906 and 1910. There was no foundation stone. The first Parish Priest of Mungindi was Fr Sam Burchell and he lived at the back of the church building which was gradually added on to. Every three months, he travelled by horse and packhorse, east along the Barwon River as far as Yetman. The Lock Adair homestead was one of his Mass Stations. Later on, he purchased a motorbike. Fr Mahoney was the first Priest to own a car, which was a T-model Ford. He also had the first wireless in Mungindi. Other churches in the Parish were: Sacred Heart, Boggabilla c. 1900; St Patrick’s, Boomi c. 1912; Our Lady Help of Christians, Garah c. May 1938; and St Dominic’s Lock Adair c. October 1940. It is thought that this building, a church hall, was completed in 1938, and was used for dances run mainly for the troops stationed in the vicinity. Fr J P O’Connor was there when Bishop Coleman opened the Hall, Our Lady of Fatima, North Star, February 1955, and St Anthony’s Church, Weemelah. The School and Presbytery at Mungindi were built in the 1930s by Frank Mahoney, Fr Mahoney’s brother. The bell at the Church was donated in memory of Rose Sarquis by her family in the early 1940s. Fr O’Connor often made the Sarquis boys climb the tower and check that it was well attached. Kevn Sarquis said Fr O’Connor reckoned it was their job as their family had donated it.